Texas Hippie Coalition are the purveyors of their own patented Red Dirt Metal sound; designing their own line in life and in music. For them, there is no other way. Texas Hippie Coalition is committed to crafting a unique, original and thoroughly raucous brand of music that’s born of both life experience and a respect for rock ‘n’ roll’s forefathers. 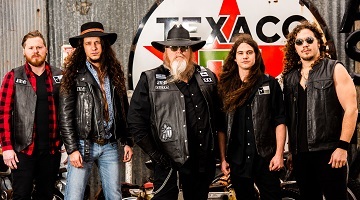 Take outlaw country, toss in a dash of Southern-fried classic rock and mix it with some potent Texas power grooves and you’ve got a combustible sonic cocktail on your hands called Red Dirt Metal. Texas Hippie Coalition’s third studio album, Peacemaker, spent over 30 weeks on the Billboard Heatseekers chart and more than 17 weeks on the Hard Music Chart. In 2014, their fourth album, Ride On, hit #8 on the iTunes Rock Album chart, #5 on the Billboard Hard Music Chart, and #4 on the Heatseekers chart. THC’s latest album, Dark Side of Black, reached #2 on the Heatseekers chart, #6 on the Hard Rock Albums, and #26 on the Billboard Top Rock chart.